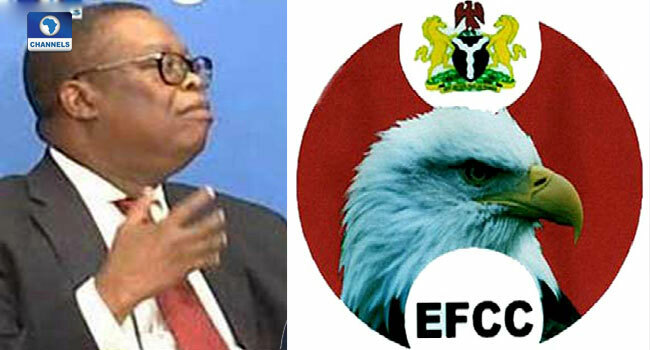 The Economic and Financial Crimes Commission (EFCC) is seeking a bench warrant against the former Director General of the National Intelligence Agency (NIA) Ambassador Ayodele Oke and his wife Folashade Oke. This follows after their arraignment failed to hold again today as the anti-graft agency said it is yet to serve the charges on the two defendants. At the Federal High Court Sitting in Lagos, the EFCC Prosecutor, Rotimi Oyedepo on Wednesday told the trial Judge, Justice Chukwujekwu Aneke that since the commission is finding it difficult to secure the attendance of the two defendants in court, it intends to make an oral application for the issuance of a bench warrant for their arrest. Justice Aneke told the EFCC prosecutor that he was yet to see the case file of the matter and would need time to go through same before entertaining any application. The EFCC had instituted a four counts charge against Mr. Oke and Folashade. That you, Amb. Ayodele Oke, Mrs. Folasade Ayodele Oke on or about the 12th day of April 2017 in Lagos concealed the sum of $43, 449, 947, 000 property of the Federal Government of Nigeria in Flat 7B, No. 16 Osborne Road, Osborne Towers, Ikoyi Lagos which sum you reasonably ought to have known formed part of proceeds of an unlawful act to wit: criminal breach of trust and you thereby committed an offence contrary to Section 15 (2) (a) of the Money Laundering (Prohibition) (Amendment) Act 2012 and punishable under Section 15(3) of the same Act. That you Amb. Ayodele Oke and Mrs. Folasade Ayodele Oke between 25th day of August 2015 and 2nd day of September 2015 in Lagos, within the jurisdiction of this court indirectly used the sum of $1, 658, 000 property of the Federal Government of Nigeria to acquire Flat 7B, No. 16 Osborne Road, Osborne Towers, Ikoyi Lagos which sum you reasonably ought to have known formed part of proceeds of an unlawful act to wit: criminal breach of trust and you thereby committed an offence contrary to Section 15 (2) (d) of the Money Laundering (Prohibition) (Amendment) Act 2012 and punishable under Section 15(3) of the same Act. That you Amb. Ayodele Oke and Mrs. Folasade Ayodele Oke between 25th day of August 2015 and 2nd day of September 2015 in Lagos, within the jurisdiction of this court directly retained $160, 777, 136. 85 property of the Federal Government of Nigeria which sum you reasonably ought to have known formed part of proceeds of an unlawful act to wit: criminal breach of trust and you thereby committed an offence contrary to Section 15 (2) (d) of the Money Laundering (Prohibition) (Amendment) Act 2012 and punishable under Section 15(3) of the same Act. That you Amb. Ayodele Oke and Mrs. Folasade Ayodele Oke between 25th day of August 2015 and 2nd day of September 2015 in Lagos, within the jurisdiction of this court directly converted $160, 777, 136. 85 property of the Federal Government of Nigeria to your own use which sum you reasonably ought to have known formed part of proceeds of an unlawful act to wit: criminal breach of trust and you thereby committed an offence contrary to Section 15 (2) (d) of the Money Laundering (Prohibition) (Amendment) Act 2012 and punishable under Section 15(3) of the same Act.